NEW YORK -- It's equivalent to left field at Fenway, except it's 4 feet deeper, 27 feet closer to the ground, and made of blue canvas. It's where yesterday's brilliant display of baseball, a 1-0 Yankee win on an equally brilliant day in New York, was decided. Right field at Yankee Stadium, close and inviting and unfair. The Sox and Yankees managed only six combined hits yesterday, three per club, and when it was all said and done, the first was the only one that mattered. ''You think about the outcome," said Tim Wakefield, who couldn't recall pitching a better game in a Sox uniform, ''you don't think a ball that barely makes the foul pole is going to beat you." But it did. Jason Giambi, hitless in his previous 18 at-bats against the knuckleballer, stepped into one with two outs in the Yankee first. Giambi had to lunge, extend, and muscle the ball, but he did sufficiently, clearing the white ''314 FT." label by little more than the length of a baseball bat. ''Pretty strong," noted manager Terry Francona. ''A good pitch. I was more hoping it would blow foul. We were helping it." Instead, it hung fair, and by day's end, allowed the Yankees to take two of three in the weekend series, closing to three games the Sox' lead in the American League East with 20 to play. ''The biggest thing was not coming in here and getting swept," said Sox catcher Doug Mirabelli, whose team would have a tenuous one-game lead if not for Curt Schilling's Saturday masterpiece. ''That would put a damper on where we're trying to get to. ''We play these guys three more times. We knew as long as we didn't lose six times to these guys in the last  games we'd feel confident in our ability to win the East. I don't think this game changes the way we feel." Once Giambi homered, he -- and nearly every other player with a bat -- stepped aside, leaving the stage to the pitchers, Randy Johnson and Wakefield, who together delivered one of the best-pitched games in baseball all season. Johnson went seven innings, allowing one hit (a Kevin Youkilis single to begin the fourth). One day after turning 42 the towering lefthander fanned eight and walked two, exiting after 100 pitches with a cramp in his left leg. ''Randy pitched unbelievably today," Wakefield said. ''It's unfortunate we had to face that." The 39-year-old Wakefield, whose season is an evolving testament to his mental focus and enhanced conditioning, pitched an eight-inning complete game, striking out a career-high 12. He conceded a single run on three hits, walking just one. He's now pitched back-to-back complete games against the Yankees, after going nearly seven years (Aug. 19, 1998) without a complete game against any opponent. And, he's lost both. On July 17 Wakefield allowed only five hits but fell, 5-3, on a Sunday night in the Fens in Al Leiter's Yankee debut. Leiter that night was excellent. Johnson yesterday was better. And Wake? ''He was so good," Francona said. ''And he had to be." Johnson, who'd lacked velocity and finish in his previous four appearances vs. the Sox this year, was bringing it yesterday. The three pitches that got him outs in the first inning all registered at 96 miles per hour. He fanned Mirabelli in the second on a fastball clocked at 97. Johnson's 2-2 pitch to Johnny Damon in the third inning flashed on the Stadium video board at 99 m.p.h. ''He was a different pitcher than we faced in Fenway," Mirabelli said. ''His fastball was a lot crisper. His slider was a lot better. This one was sharp, it was biting, it's what you'd expect out of him. You hope someone runs into a fastball, or he hangs a slider, but he never did." Wakefield, meanwhile, was throwing about 30 m.p.h. slower but getting a similar share of swings and misses. He whiffed six of seven batters at one point. Jorge Posada and Bernie Williams went down swinging to end the second inning, and John Flaherty did so looking to begin the third. Bubba Crosby then tripled to right, but Derek Jeter looked at strike three, and Robinson Cano followed with a whiff. Giambi, leading off the fourth, also fanned. ''I know it's their guy and our guy, one extreme to the other," Francona said of the gulf in the pitchers' usual velocity. ''But [Wakefield] almost matched [Johnson] pitch for pitch. ''That [Giambi] ball hooks a little down the right-field line, and we might still be playing." As it was, the Sox nearly extended this to extra innings. Johnson left after seven, clearly disturbed by an issue in his leg. ''It looked like he was grabbing his knee," Mirabelli said, ''so I would have been shocked if he came out in the eighth." 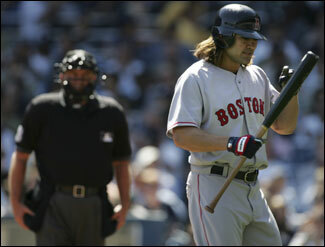 Johnson said he felt something ''overthrowing" to Manny Ramirez, his second-to-last batter. And that gave the Sox life. Tony Graffanino, leading off the eighth, singled to left off Tom Gordon. Mirabelli then popped up and no Yankee caught the ball, even though it landed on the back of the pitcher's mound. But Alex Rodriguez threw to second, cutting down pinch runner Adam Stern. Bill Mueller flied out, and Francona pinch hit David Ortiz for Gabe Kapler. Ortiz didn't start yesterday, bothered by a tight back and historically bothered by Johnson (2 for 14 lifetime). Joe Torre called for Mariano Rivera. Rivera went to a full count on Ortiz, broke his bat in half on a check swing with the count full, then walked him on the seventh pitch. Damon, yesterday's DH because of an ailing throwing shoulder, then grounded out, but not before making Rivera throw him 10 pitches, one of which Damon shot down the right-field line, just foul, for what nearly was a tying, or go-ahead, double. ''He didn't miss a pitch," Damon said of Rivera. ''He was right on the corner [of the plate], give or take the size of a baseball. I got close. But close doesn't do it." Edgar Renteria led off the ninth with a lined shot headed for center field. But Rivera stuck up his glove and snared it. ''Unbelievable," Renteria said. ''You know, he's one of the best fielding pitchers in baseball." Trot Nixon, pinch hitting, grounded out. But Ramirez, with two outs, walked, and Kevin Millar improved to 6 for 13 career against Rivera with a single to right-center. With two on, pinch hitter John Olerud (a .177 career pinch hitter) went down swinging. A single in that situation, and the Sox might have left here with a five-game lead in the East. ''You really have to sweep the series to really gain any ground," Wakefield said. ''Leaving here with a five-game lead would have been nice, but they only gain a game on us, and we have other games to play. ''I'm very confident in this team."